By "Real World" I mean, of course, ham radio. There's been a lot of discussion recently among some of my friends about GPS disciplined oscillators (GPSDOs) for use in amateur radio applications. While GPSDOs are a great idea, I'm not sure that for many ham applications one should be considered a requirement. Starting from that question, this page describes some of the desirable attributes of a frequency source for ham radio. Accuracy is knowing that when I say I'll see you on 10 368.105 231 MHz, that's where you'll find me. Stability is how closely I'll stay there over various periods of time. Precision or resolution is how many digits my measurement has. A measurement's precision can be, and frequently is, much greater than its accuracy. In other words, you can't always trust the last digits! Stability breaks down into three categories: long term stability, which is usually measured over periods of a day or more; short term stability, which is usually measured over periods of perhaps 0.1 second to one day; and phase noise, which deals with very short time scales and effects that look more like unwanted modulation than a wandering frequency. Long term stability is dominated by a progressive change in frequency called drift, that virtually all oscillators undergo. Aging is often used synonymously with drift, but technically drift doesn't have to arise from an aging process. Drift often proceeds in one direction and may be predictable based on past performance, at least for a few days. In some oscillators drift may be more random and can change direction. Long-term drift will affect the accuracy of the oscillator's frequency unless it is corrected for. Short term stability resembles noise and is not normally predictable. It reflects the uncertainty of the oscillator's frequency at a given instant in time. 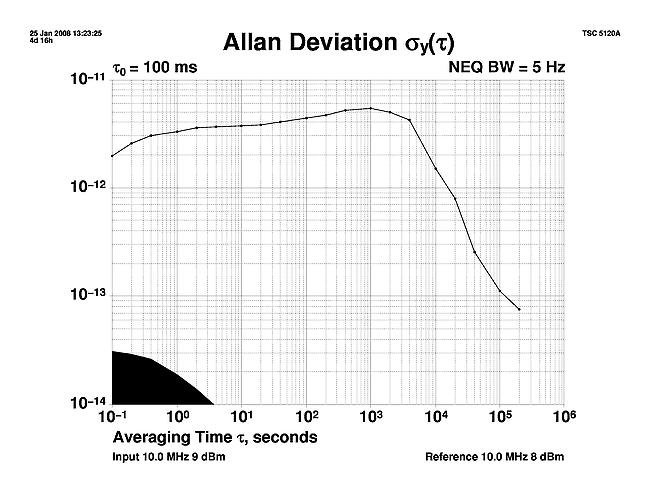 Phase noise is usually thought of in the frequency, rather than the time, domain. Like short term instability, it results from the inherent noise in any component that contains moving atoms (i.e., everything that's not either a total vacuum, or at absolute zero). Some oscillators are also specified for stability over variables other than time, such as temperature, power supply voltage, shock, and even gravitational effects. While these factors are important, I'm going to concentrate on time-related stability in this document. Stability measurements are only meaningful when the time between readings is specified. In other words, short or long term stability is the consistency of measurements taken at stated, equally spaced, intervals. The measurement interval is referred to as tau. For example, we might say that an oscillator's stability is "1x10-11 at tau = 1 second." Long term stability is often specified "per day" or "per month." Short term stability is almost always stated in seconds. It's not worth going into great detail here, but stability numbers are usually generated using a formula that produces the Allan Variance, abbreviated as AVAR. AVAR is a statistical measurement similar to standard deviation, but optimized for the kind of noise that oscillators exhibit. The analysis of precision time and frequency sources is dominated by statistics. For phase noise, we switch to a logarithmic power scale referenced to the strength of the carrier. There is more noise power in a wide bandwidth than a narrow one, so by convention the noise power is normalized to a bandwidth of 1 Hertz. For some reason, this measurement of SSB noise power is called script L, after a character that looks, well, like a cursive, or script, upper case "L". There's no representation of this character in common computer fonts, which makes chart labeling a bit interesting. The unit of measurement is dBc/Hz which means noise power in a 1 Hertz bandwidth relative to the carrier level, at a specified frequency offset from the carrier. GPS receivers designed for timing purposes output a pulse-per-second ("PPS") signal that is accurate on the scale of nanoseconds. The GPS signal is controlled by the US Naval Observatory, so it can be received with an accuracy of a few parts in 10-13 compared to USNO (and USNO time is kept within a few nanoseconds of the National Institute of Standards and Technology time scale). That PPS signal can be used to steer, or discipline, a ovenized crystal oscillator ("OCXO") in a phase lock loop configuration -- essentially, a PPS signal derived from the OCXO is compared to the GPS PPS, and a control circuit tweaks the oscillator frequency to keep the two PPS signals at the same time offset, or phase. The GPS PPS signal in the short term (less than a thousand seconds or so) is quite noisy. Various factors cause it to bounce around by perhaps 50 to 150 nanoseconds. That doesn't sound like much, but in fractional frequency terms, it's not so great -- even 100 nanoseconds per second is only 1x10-8. Over time this noise averages out to zero, so day-over-day the GPS PPS is several orders of magnitude better. On the other hand, a good crystal oscillator is easily better than 1x10-11 from second to second; the very best may be a few parts in 10-13. But in the long term, aging can move an OCXO off frequency by parts in 10-9 per week -- or even per day! Because the control circuits apply a voltage to the crystal oscillator tuning circuit, any noise on that control voltage will degrade the oscillator's performance. As a result, a disciplined oscillator will never perform quite as well as the same oscillator running with no external influence. 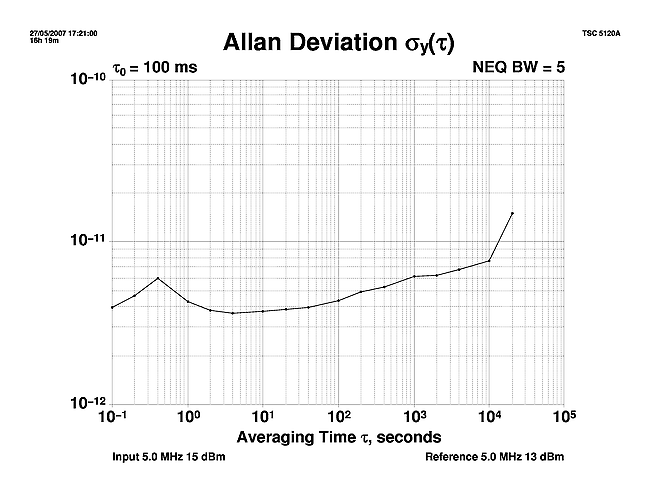 The performance degradation may show up as increased phase noise or decreased short term stability. With careful design, this contamination can be minimized, but it's always there at some level (unless the oscillator is so bad that its inherent noise masks the control noise). What this all means is that a GPSDO provides excellent accuracy, but does not improve short term stability or phase noise -- those will usually be optimized in a stand-alone crystal oscillator. The frequency accuracy of the GPSDO is essentially that of GPS, plus or minus the short term stability of the crystal oscillator. In other words, a properly operating GPSDO is probabably accurate to parts in 10-13, and if you measure it once per day, those measurements will be constant at about that level. But if you make measurements every second, those could differ from each other by parts in the eleventh or twelfth. Finally, GPSDOs present two operational issues that can't be ignored: (a) they don't like to be turned off, because it takes hours to days for the system to stabilize after power on; and (b) they don't like to be moved, because optimum performance depends on the GPS knowing accurately where it is, and it takes several hours to do an adequate self-survey. These reasons mean that a GPSDO shouldn't be part of a system with a power switch, and that one may not be practical for a mobile or portable system. A battery operated OCXO could be a much better solution. With that stuff behind us, what sort of accuracy and stability do we need for amateur applications -- not bragging rights, but useful capabilities on our bands? At HF,accuracy of 0.1 Hertz requires no more than 3.33x10-9 (i.e., 0.1 Hz at 30 MHz). And, given Doppler and other atmospheric effects, it's questionable whether 0.1 Hertz accuracy is even meaningful. A GPSDO is easily capable of parts in 10-12 and can approach parts in 10-13 if you average for a day or more. That means a GPSDO is something like 3,000 times better than needed to meet a 0.1 Hertz accuracy specification at 30 MHz. A crystal oscillator in an oven (an "OCXO") doesn't perform as well, but can perform "well enough." For example, a very small DIP-sized oscillator from MTI (model 205) ages by 5x10-9 per day, and has a thermal stability of 3.5x10-6 over a -30 to +70 degree C range. That doesn't meet our 0.1 Hertz at 30 MHz requirement unless you calibrate it every day. But it's a tiny, (relatively) inexpensive oscillator. A larger and more expensive unit (around $300-$500 in single unit quantities) like the MTI 260 series offers aging down to 5x10-11 per day, and temperature stability over the same range as low as 2x10-10. That oscillator would need to be adjusted only every 90 days or so to stay within 0.1 Hertz at 30 MHz. Short term stability frankly isn't an issue at HF. Even inexpensive oscillators will have stability over periods of 1 to 100 seconds measured as parts in 10e-9, or around 0.1 Hertz at 30 MHz. Very few amateur applications require stability at this level; I haven't done exhaustive research, but the tightest stability requirement I've found is for PSK31 in QPSK mode, with a quoted stability requirement of 4 Hz. -- that's only 1.33x10-7. 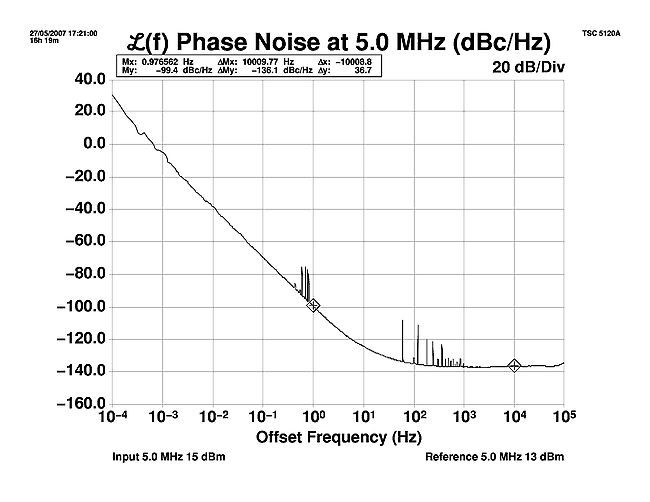 Phase noise is an important factor at HF; poor phase noise can result in increased interference, and poor operation of narrow shift digital modes. However, in most HF rigs other components such as synthesizers and amplifiers set the phase noise performance; the crystal reference oscillator is normally much quieter than these components. At higher frequencies, short term stability and phase noise can become more important issues because the reference is being multiplied by large numbers. 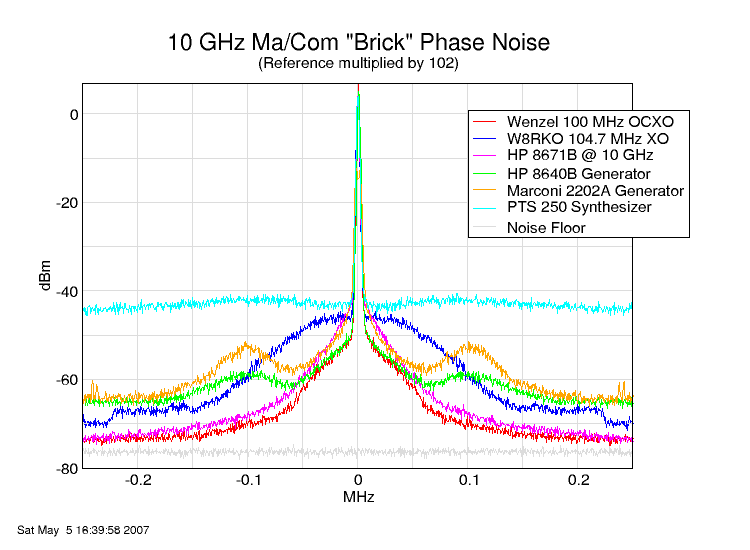 Short term stability of 10-9 at 10 GHz can put a 10 Hertz wobble on the signal; that may be enough to impact narrowband digital modes. Perhaps more important is the effect of multiplication on phase noise. 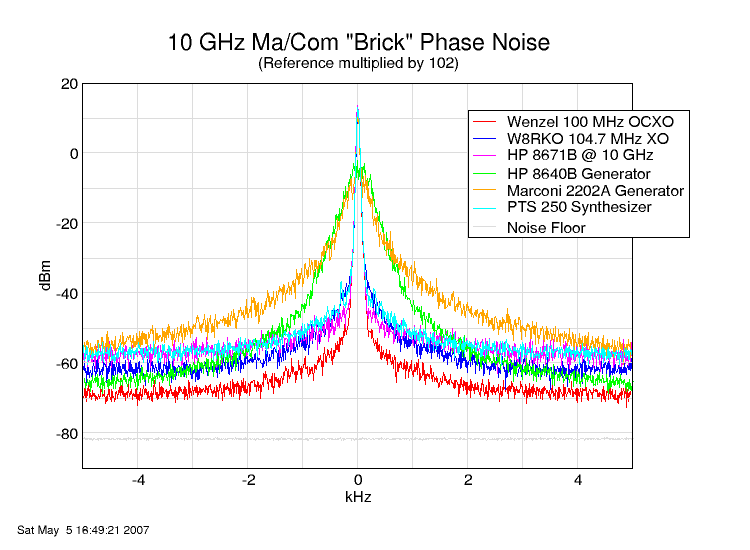 Phase noise increases in a 20log progression, so multiplying from 10 MHz to 10 GHz increases phase noise by 60 dB -- that's enough to significantly reduce signal to noise ratios, and also to smear out the signal peak to the extent that even CW sounds mushy. 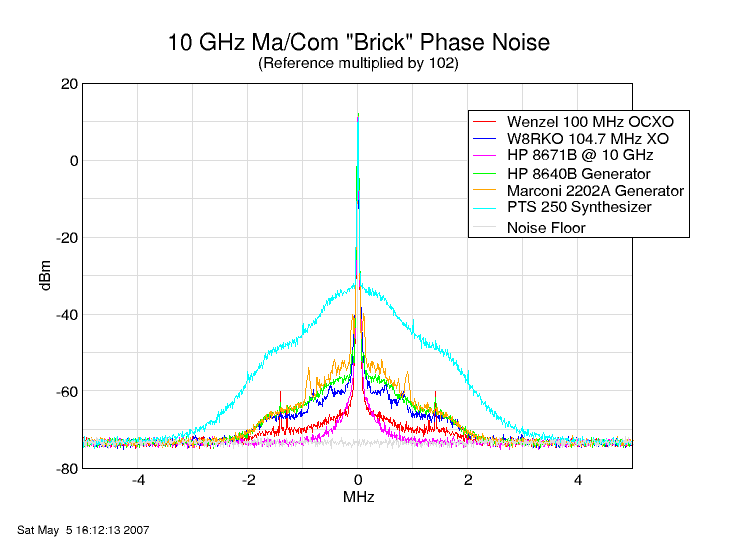 The following three spectrum analyzer plots show the output spectrum of a 10 GHz "brick" oscillator when driven by various oscillators in the 100 MHz range (multiplying that signal by a factor of 102), as well as an HP microwave signal generator for comparison. They show different spans (plus/minus 5 kHz, 250 kHz, and 5 MHz) away from the center frequency; it's important to look at all three spans because you'll see different performance at different offsets from the carrier. The most important thing to take from these plots is that the quality of the reference is very important to the quality of the multiplied signal.